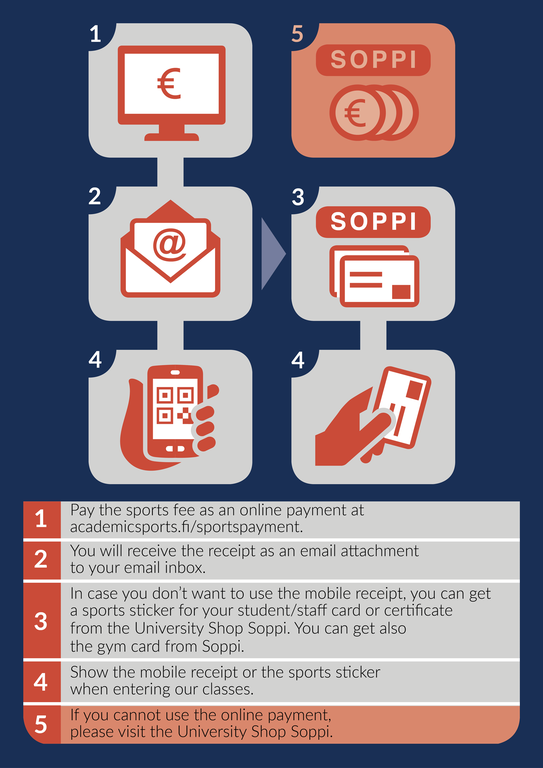 Pay the sports fee as an online payment at academicsports.fi/sportspayment. You will receive the receipt as an email attachment to your email inbox. In case you don’t want to use the mobile receipt, you can get a sports sticker for your student/staff card or certificate from the University Shop Soppi. You can get also the gym card from Soppi.If you cannot use the online payment, please visit the University Shop Soppi. Who has a right to participate to Academic Sports? Academic Sports services in Jyväskylä, including group fitness classes, ballgame sessions, common gym services and sports events. These services are meant for the students and staff of the University of Jyväskylä and JAMK University of Applied Sciences as well as for the students of the Jyväskylä regional unit of the HUMAK University of Applied Sciences. University Sports services that include courses, free classes in various sports and other activities meant only for the students and staff of the University of Jyväskylä. The following student and staff groups are entitled to the whole offering of University Sports (including the Academic Sports services) in accordance with the University Sports price list. The following student and staff groups are entitled to the whole offering of Academic Sports services in Jyväskylä. On 14 September 2017, Director of Administration Kirsi Moisander made a decision on the external users of Academic Sports services. Students pursuing a bachelor’s, master’s or doctoral degree at JYU who have registered for attendance for the current academic year at JYU. They can prove their eligibility for the services with a student card or registration certificate. JYU’s visiting doctoral students or exchange students who have valid study rights. They can prove their eligibility for the services with a student card or registration certificate. Students pursuing separate pedagogical studies or a minor in sports pedagogy who have valid study rights at JYU. They can prove their eligibility for the services with a registration certificate. Students who pursue JOO studies with valid study rights at JYU. They can prove their eligibility for the services with a registration certificate. Employees of JYU or its subsidiaries. They can prove their eligibility for the services with a staff card or a similar certificate. The University of Jyväskylä’s grant employees who have no employment relationship with the University but work at the University premises with the permission of the head of department. They can prove their eligibility for the services with a grant researcher ID card. Degree students of JAMK University of Applied Sciences and students of its Open University of Applied Sciences. They can prove their eligibility with a student card or registration certificate. Employees of the JAMK University of Applied Sciences. They can prove their eligibility for the services with a staff card. Students of the Jyväskylä regional unit of the HUMAK University of Applied Sciences and students of its Open University of Applies Sciences. They can prove their eligibility to the services with a student card or registration certificate. Other students supplementing their degrees or completing separate study entities, students of the Open University and part-time untenured teachers at JYU are not eligible for the services of University Sports. The fee for the services will be decided separately. This decision overrules all prior decisions on the rights to use the University Sports services.